Registration Deadline: March 2nd unless the program is full prior to this date. The workshop will begin Tuesday, March 12th and continue through Friday, March 15th 2019 at the Hawthorn Center in Columbia, MD. 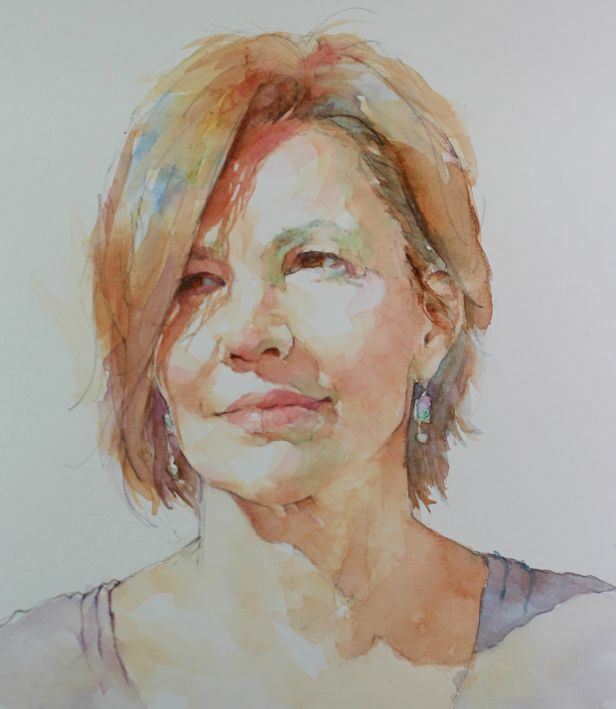 Workshop description - "Watercolor Portrait Sketching"
I will have partially pre-drawn portraits for you to work on as part of our exercises - or you may draw freehand. We will all do some limited freehand drawing of parts of faces (not full portraits). You will be asked to bring along two pre-dawn portraits of your own on watercolor paper. (on approximately 9”x11”paper, head only). Option: Bring ONE smaller portrait to practice as a "Quick Sketch" and ONE larger, more involved piece. The 4 day format of the workshop will give us time to practice the techniques we are exploring. The references we’ll be working with will cover a wide range of ages and skin tones. This workshop will be a combination of demo and hands-on portrait work. 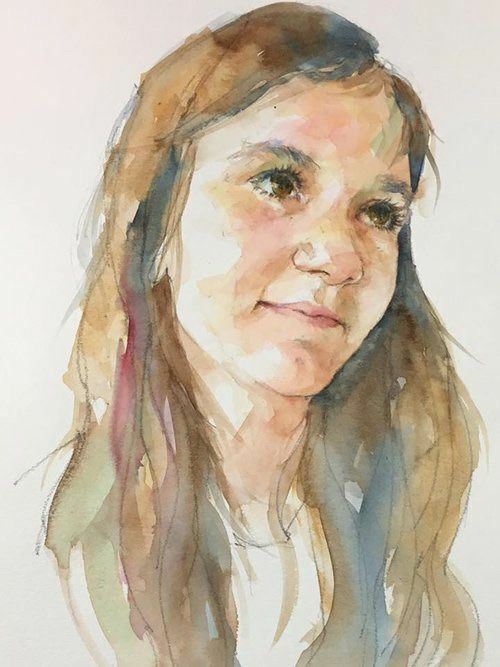 On day 3, we will work on one pre-drawn portrait provided to you and then begin work on a portrait of your own that you have prepared for the class. Day 4 will be a continuation of your own portrait work. We will discuss how to translate the principles we’ve practiced on the “Quick Sketch Portraits” to a larger, more finished portrait. You may want to begin work your own more involved portrait on this day. 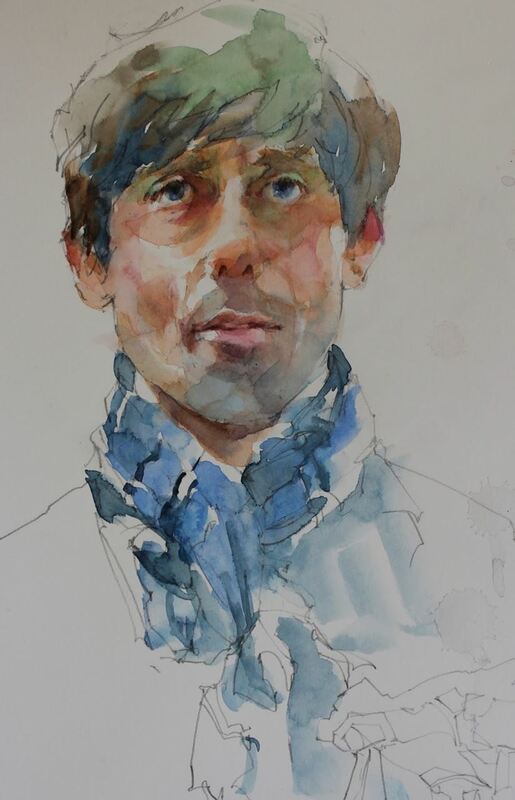 If you would rather continue on the smaller portraits - this will be a time for additional practice. Tech Tips: Each day we will explore a technology tool to use to help you in your portrait paintings. 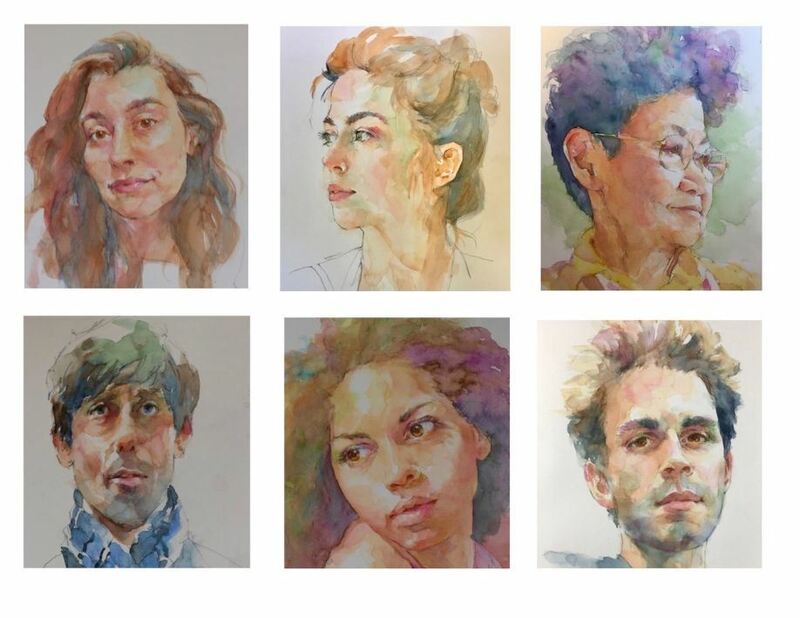 Students should be comfortable with painting in watercolor, but do not need to have experience with portrait painting. Bring two completed drawings of your own (using your own reference photo) on an (approximately) 9” x 11” sheet of watercolor paper. Bring along the printed reference picture or have it available on your digital device. Optional: For Day 4, you may want to work on a larger, more involved portrait or figurative work. Prepare your drawing in advance for that piece. Bring along several smaller sheets of watercolor paper (around 8 x 10 ) or a watercolor block. I use 200 lb Saunders Waterford Hot Press - or other hot press brands. The partially drawn portraits that I provide will be on hot press paper. Bring all your usual watercolor supplies: water container, paper towels, board to attach your watercolor paper to, drawing pencils (I just use BIC #2 mechanical pencils), push pins or tape. Bring your own palette and brushes that you are comfortable with. I’d suggest using no brushes smaller than a #10. I use Loew Cornell Ultra Round brushes (very cheap and I just grab a new one when I wreck the point) I’ll have some of these for sale at the workshop. *Starred items are ones I couldn’t live without for portrait work. The price for the workshop is $325 for BWS members (Signature Artists and Associates) and $375 for non-BWS members. Paid registrants who cancel on or before .February 25th will receive a full refund less a $25 cancellation fee if the spot can be filled from the waiting list. If the spot cannot be filled, the amount refundable is 80% of the workshop price. Paid registrants who cancel after February 25th will receive a full refund less a $50 cancellation fee if the spot can be filled from the waiting list. If the spot cannot be filled, no refund will be given. 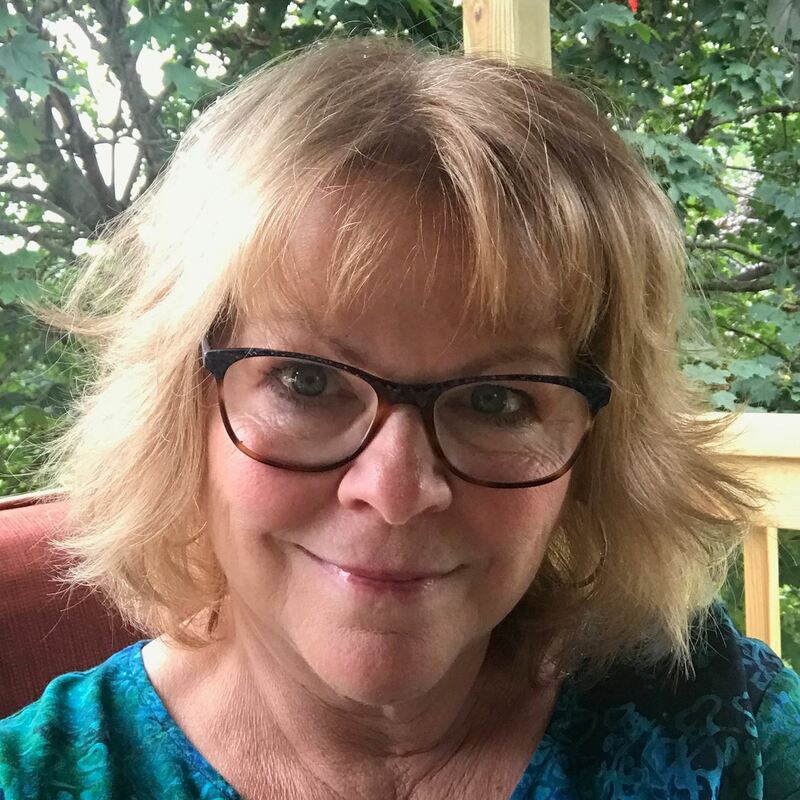 In the event of inclement weather, the workshop will still be held unless the Hawthorn Center is unable to open or the workshop artist is unable to travel. If BWS cancels the workshop, then all paid registrants will receive a full pro-rated refund for those days that were cancelled.